The Turning Gate has released new versions of several of the Lightroom Templates with some great improvements. The first and most favorite addition of mine is the addition of a footer. Matt beat me to this one as I was working on creating a footer for several of his templates when this was released. While this image is from the LR Pages 1.2 template, they are the same in th other templates. Notice how you can choose the color of the text, the font and the font size. You can even input html tags and they will be properly rendered. I have done this with the ‘a’ tag for hyperlinks so I can direct people to various other pages. 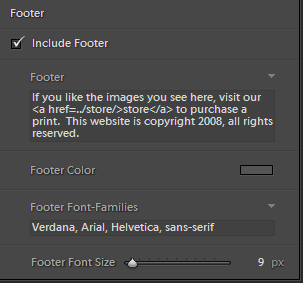 Check the box to enable the use of the footer and type something in. If you haven’t looked recently, visit Matt’s site and don’t forget a donation for his work!